To make your voice heard when the Congress is out during their month-long recess in August, reach out to the policy makers through social media. Digital advocacy campaigns over Twitter and Facebook are not only gaining popularity, but are also surprisingly effective. Tapping into this, the Association for Career Technical Education (ACTE) has developed a compelling infographic to spread the message of CTE and the importance of stopping cuts to Perkins funding. The call to action is to share the infopgraphic on Facebook pages of your Members of Congress throughout the month. More information on this is available here. 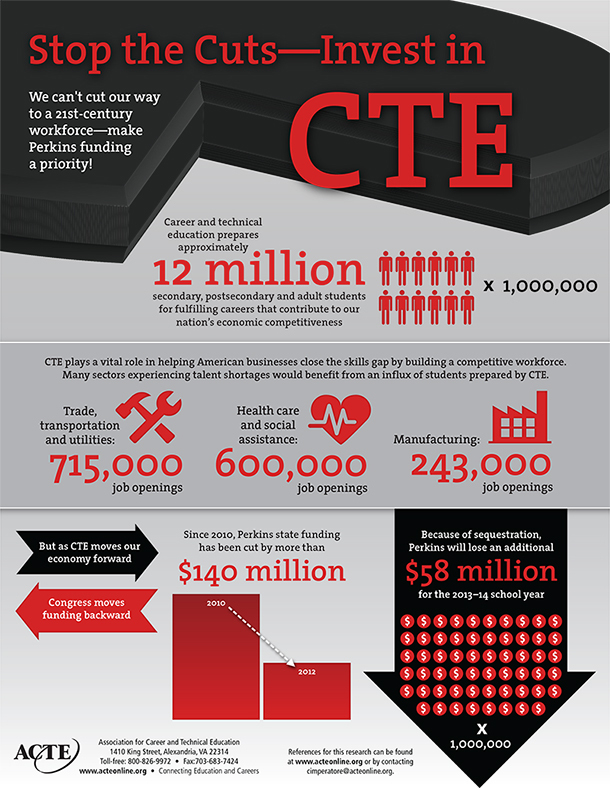 The infographic creatively draws attention to stopping the cuts and increasing CTE funding. This entry was posted on Wednesday, August 21st, 2013 at 12:23 pm	and is filed under Uncategorized. You can follow any responses to this entry through the RSS 2.0 feed. Both comments and pings are currently closed.